The days have long been over when IT could dictate what kinds of endpoint computing devices should be in their end user’s hands. But the notion of “bring your own device” (BYOD) has taken hold in the past few years means having tablets and smartphones perform truly useful business-related work. Now the particular endpoint, whether it is a desktop or a mobile, no longer matters. Indeed, mobiles are being used more and more as the main endpoint browsing device and as the default computing device. There are some big benefits for IT with BYOD: they don’t have to invest time in their “nanny state” approach in tracking which users are running what endpoints. Or have to research which mobiles will be blessed by the corporate purchasing department. Instead, they can free up these staffers to improve their apps or deliver better service to their end users. For these reasons, BYOD has been well received. Users don’t want to wait on IT to finish a requirements analysis study or go through a lengthy approvals process: they want their mobile apps here and now. However, the small business market has been largely a poor stepchild and not much of a beneficiary to the BYOD revolution. The SMB IT manager, where he or she exists, doesn’t have a lot of great choices to support improving the productivity of their tablet users. The challenge is that users these days want something more than just processing emails on their mobile devices: they want to be a full participant in sharing files, co-editing documents and presentations, and running corporate apps that in the past have been largely geared towards Windows endpoints. The IT manager is faced with a series of options to support these new and more advanced tablet users. Each solution makes some compromises in terms of document fidelity, overall security, collaboration features and ease of access. Document fidelity is defined as being able to work on common Windows tools such as Word, PowerPoint, etc. on a tablet and see the same fonts and features as you would see on a traditional Windows PC. Overall security means having policies that can restrict who has access to particular files and apps on the mobile devices, or completely sandbox a business environment from one’s personal app collection. You also want to be able to collaborate on documents among multiple authors, so that they can see in real-time what changes their colleagues have made to their documents. Finally, ease of access means being able to obtain particular files without having to go through many steps or multiple and complex authentication methods. Over the past several years, numerous vendors have tried their hand at fixing these issues and there are a number of products and services that can be combined together. 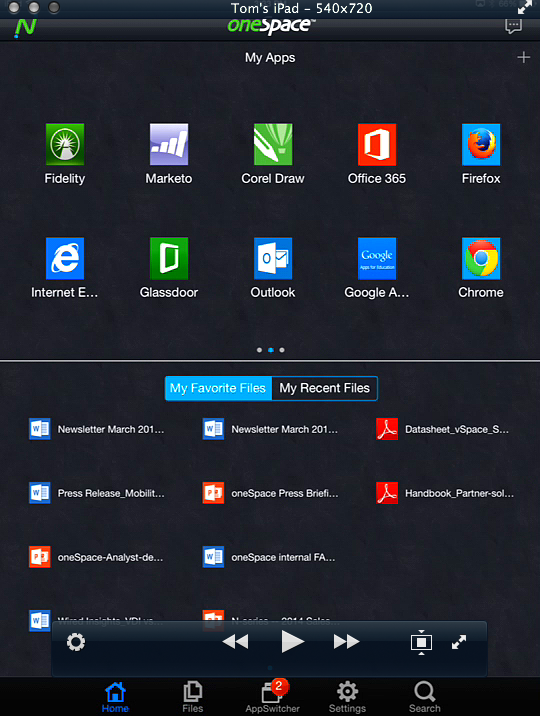 There are cloud-based storage services or office app suites, custom connection apps that allow tablets to access, transfer and view files and remote terminal sessions that can bring up Windows desktops and their apps. There are also various mobile device management products that can sandbox email and app access. 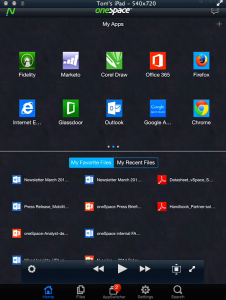 One other solution involves creating an entire workspace on a tablet, sometimes as a Web service. I recently had a chance to do some custom consulting work for such as solution from NComputing called oneSpace, which compliments these products in a way that you can access both network file shares as well as cloud apps, and do so in a way that seems natural for a tablet or touchscreen user. You can see a short screencast video introduction to how this works here. Workspaces could be the future for corporate tablet usage. The choice of end user device ALWAYS matters. Tablets aren’t as useful for the work environment because they are merely consumption devices. Producing content on them is a chore. The business world may reach information consumers on tablets and phones, but they need more for their own people. (see Horse Sense #112 – Consumption and Production – May 27, 2014 http://www.ih-online.com/hs112.html). BYOD is *not* an initiative of the IT departments, but of those users who wish to use their own resources to access the information they need. They don’t want to carry two cell phones or tablets. Many end users are finding out that dealing with large amounts of e mail on a phone or composing a letter on a tablet without a keyboard is a real pain. And, phones and tablets are expensive. That is why Ultrabook (Intel trademark) class computers, especially those that can turn into a tablet as well, are making heavier inroads into the business space. Words with Friends is annoyingly slow on my 4G HTC DNA One phone. It’s easier to see and work with on my Nook HD+ tablet. But, for real work, I lug my laptop back and forth to work. There is no way I could be productive on a tablet or a phone. They can help with *part* of my work, but the laptop, desktop, and server PCs are far from dead, especially in business. As to BYOD, it is a security and support nightmare for IT unless they can reset user expectations significantly. Working from your own device in a work environment has to have a lot of limitations. And, while policy may say BYOD is OK, don’t believe all the hoopla. There is a right tool for the job and though IT may have to support your BYOD desires, you may suffer lost productivity and significant pain if you don’t listen to recommendations and tailor your device usage to the work you want to do.